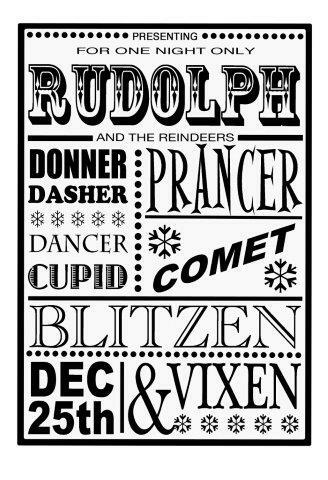 This is one whole stamp in the form of a show poster presenting Rudolph and the other reindeer with the date 25th Dec. It would work equally well as a background or centrepiece for a Christmas card. Some of the lettering could be coloured in with marker pens or use a glue pen and add a sprinkle of ultra fine glitter to the wet glue for a sparkly finish. Approximate size 8.7 x 12.3cm (3.4 x 4.8 inches).